With today's release of December comics orders from Diamond Comic Distributors — and our subsequent analysis and estimates for December 2012 comics sales now posted — The Comics Chronicles has drawn upon that information to project estimates for the Top Thousand Comics and the Top Thousand Graphic Novels for 2012. The tables are on the page just beneath the image links to individual months. As in past years, it is a large page, necessarily, so it may take a bit to load. Also as in the past, I have rounded off to the nearest hundred. The Top Thousand Trades went for $71.4 million, a $13 million increase over last year's total of $58.4 million. Combined, these two lists alone account for about 55% of the orders by dollars Diamond received in publishing last year, which was around $474.6 million. 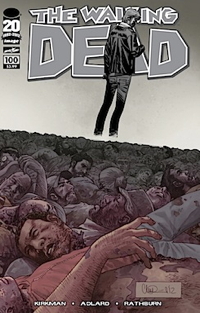 Walking Dead #100 was the top seller of the year; Comichron estimates that, all told, around 353,200 copies of the regular issue were sold during the year. The Chromium variant is projected to wind up on the list, too, with orders approaching 31,200 copies; together, that brings the Diamond sales for the title to around 384,800 copies. That's enough to make it the second highest-selling comic book of the 21st Century, behind only the Obama Amazing Spider-Man #583, with orders of 530,500 copies in 2009. You can see the top-sellers by year here. The entire Top Comics of the 21st Century list has been updated; the merger of the two Walking Dead variants follows last year's practice of merging DC's Combo issues with the main versions. (They're kept separate on the individual pages for each year.) As we can see from just the top of the list, One other 2012 title, Uncanny Avengers #1, also cracked the Top 10. Forty issues from 2012 made the Top 300 for the 21st Century list — that's a big number. There were 24 new entries that made the list in 2011, and only nine in 2010 (some of which were pushed off by this year's entries). Twenty 2012 issues made the Top 100, and eight made the Top 50. There is a separate page that ranks just 2000-2009, if you just want to see the previous decade. That's two publishers that weren't on last year's list: Valiant and Boom. I don't maintain a Graphic Novels of the Century list — too much missing data from earlier years — but this year's three-peat leader, Walking Dead Vol. 1, must be getting up there. As seen on the 2012 chart, Comichron projects the overall orders for the volume for 2012 to be somewhere around 74,700 copies, worth around three quarters of a million dollars at retail. As noted here last Friday, retailers ordered more than half a million Walking Dead softcover and hardcover graphic novels in the year, worth nearly than $10 million at retail; combined with the comics, that likely comes close to $13.6 million — which would give Walking Dead comics, all on their own, a 2.8% market share. That would make it the seventh largest publisher for 2012! My best guess is that there are between 2,100 and 2,200 comics that sold at least 10,000 copies in 2012. There are 21 other years of Diamond annual reports on the site, going back to 1991.